Coverage for Unmanned Aerial Systems (UAS a.k.a. drones) is currently available to JIF members. UAS’s are now a fact of life, and we intend to help every member use them in a productive, safe and responsible way. 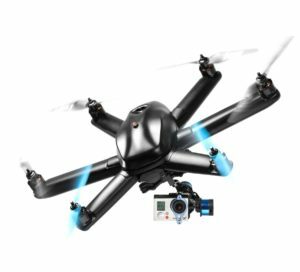 Who is Using Drones on Your School’s Property? Coverage is provided for owned and non-owned liability, but not for physical damages to a UAS. Coverage is not automatic and can only be secured by following the risk management program that the underwriter and the JIF Executive Director developed as a practical method for managing known risks. Take an inventory of every UAS owned, leased, or loaned to your district. Register each with FAA and SPELL JIF. Identify all Pilots and have them attain the Pilots Certification by going to Dartdrones.com Drone Pilot Test Prep. Each Pilot will pay online. Use code spelljif225 to receive discounted price of $225 per Pilot. Payment is made either by the district or the Pilot directly depending upon district policy. SPELL JIF does not contribute to the cost of obtaining Pilot Licenses. Have each Certified Pilot sign a SPELL JIF Pilot Warranty Statement, warranting they have read, agree and will operate their specifically assigned UAS according to the district’s policy and procedure on UAS and further, that the Certified Pilot is thoroughly familiar with the DJI Pilot Training Manual for the specific UAS they are permitted to pilot. A UAS is the unmanned aircraft (UA) and all of the associated support equipment, control station, data links, telemetry, communications and navigation equipment, etc., necessary to operate the unmanned aircraft. The UA is the flying portion of the system, flown by a pilot via a ground control system, or autonomously through use of an on-board computer, communication links and any additional equipment that is necessary for the UA to operate safely. The FAA issues an experimental airworthiness certificate for the entire system, not just the flying portion of the system. A UAS is a device as described in the two bullets above and weighs 55 pounds or less including any and all payload. Each UAS owned, leased, borrowed or loaned to a member school district must be registered with the FAA and with SPELL JIF. The policy shall not apply while an aircraft is in flight unless the pilot in command meets the following qualifications. Pilots must have successfully completed the SPELL JIF designated training program, which is an on-line course that takes 4 hours, costs $190.00 for each pilot and pilots must achieve a passing grade to receive a USI (Unmanned Safety Institute) completion certificate. No person may operate a UAS unless they have successfully completed the SPELL JIF designated training program and prior to flight operations have familiarized themselves with the DJI Pilot Training manual for that unit and should be able to demonstrate competence in all areas of that manual. Student pilots obtaining instruction are approved provided that they are under the direct supervision at all times while operating the scheduled aircraft of an approved and certified instructor pilot. It is further required that each pilot be specifically approved by the SPELL JIF loss control department. Two hundred foot horizontal clearance of all populations – human activity filmed from a UAS must be filmed from a side advantage and not directly overhead of human players, coaches, spectators and/or attendees. 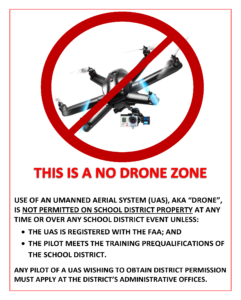 Signage on all fields: UAS/Drones are not permitted unless specifically authorized by the District. 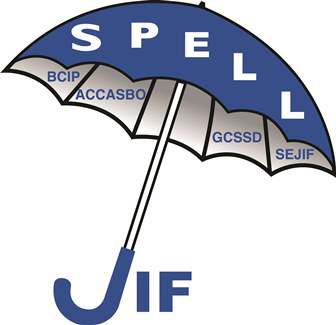 Policy and Procedure adopted at SPELL, local JIFs and every member district to include these conditions. Policy and Procedure adopted at SPELL, local JIFs and every member district requiring contractors who wish to use a UAS must adhere to pilot certification requirements and proof of minimum required insurances.